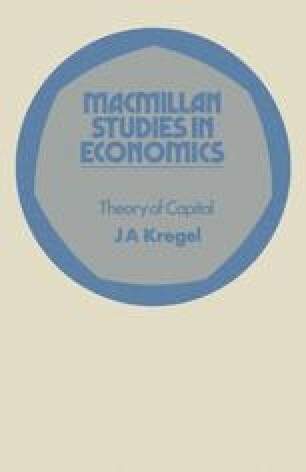 The current revival of interest in and controversy about capital theory has been primarily concerned with the measurement of capital in value terms as implied by the four propositions concerning the return to capital and capital intensity given above (p. 14). In investigating these relations most writers use simplified examples of systems of production (stemming either from  or  — difference between the two approaches are highlighted in ). In this chapter we shall use a simplified system of production (taken from ) where commodity outputs are produced by commodity inputs (non-labour means of production) and labour. In addition, we shall use numerical examples to try to highlight the basic propositions that have been derived from the study of such systems. We must keep in mind, however, that these simple examples are not meant to be realistic representations of real economies, but only representative of the relations observed in real systems.